This document will tell you everything you need to know about how intents get executed and how you can configure your intents to make engaging and entertaining skills for your users. Intent triggering is an event or action that causes the intent to be executed. An intent can be triggered (executed) in many different ways. 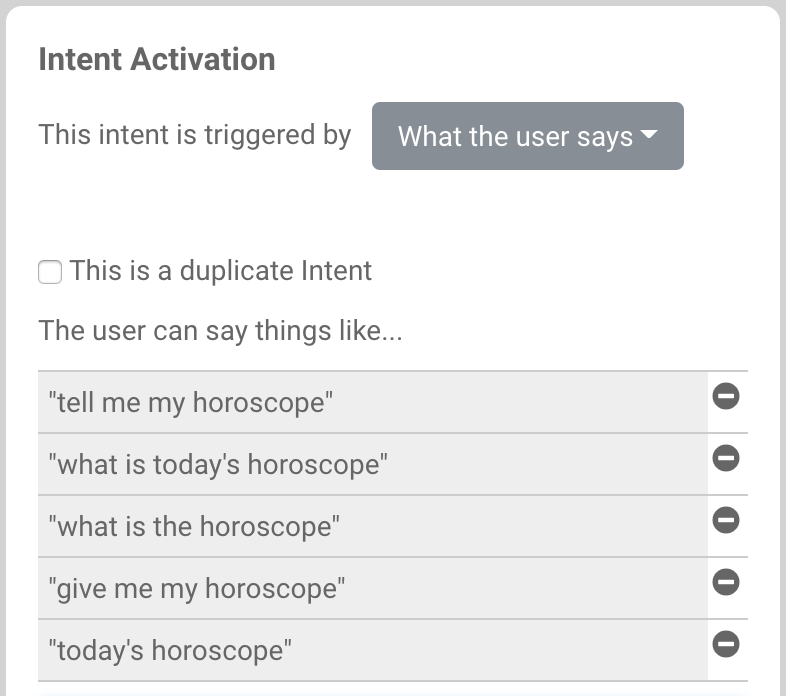 You define intent triggering on the Activation tab of the Intent Settings panel. Whenever the user says any of the above phrases or anything similar, the intent will be triggered. When the user says "Help" - triggers the intent whenever the user says something that indicates they need help. When the user says "Yes" - triggers the intent whenever the user says something that indicates the user means "yes"
When the user says "No" - triggers the intent whenever the user says something that indicates the user means "no"
When the user says anything - this option is a "catch all" option that will trigger the intent regardless of what the user says. This intent will only be triggered if there are no other intents that are also triggered. Intents can also be triggered directly by other intents. Use this option if the intent should "only" be triggered by another intent and shouldn't be triggered in other ways. Audio Player "Almost Finished" - this will trigger the intent when the currently playing track is almost finished playing. You can use this to queue another audio file or take other actions. By default, intents can be triggered at any time. You will likely want to create a logical flow to your skill so users can only trigger certain intents when you want them to. You can do this by specifying the one or more intents that must be executed before the current intent will be activated and able to be triggered. Let me give you an example. 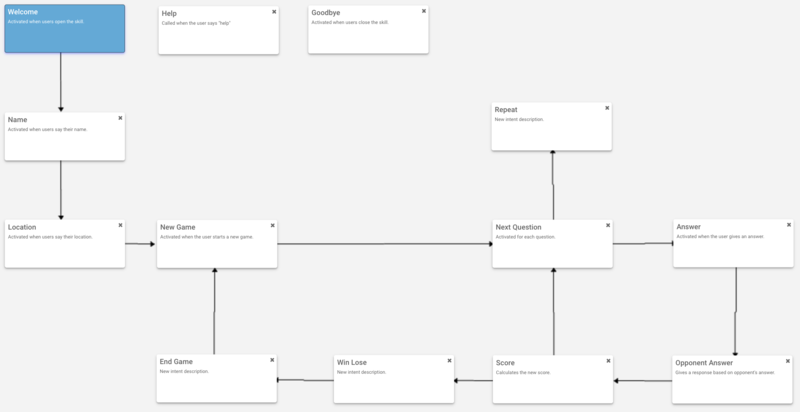 Let's say I'm building a trivia game. After the user opens the skill, we welcome them and then we want to ask them for their name. After they give us their name, we want to ask them where they are from. We don't want them to be able to tell us where they are from first. To do this, we set the "Name" intent to be only activated by the "Welcome" intent. This means the "Name" intent cannot be triggered unless the "Welcome" intent is the current intent. Voice Apps will draw a connecting line with an arrow pointing from the "Welcome" intent to the "Name" intent. Similarly, we set the "Location" intent to be only activated by the "Name" intent. This means the "Location" intent cannot be triggered unless the "Name" intent is the current intent. Again, Voice Apps will draw a connection line with an arrow pointing from the "Name" intent to the "Location" intent. Continuing this process, you can create skills that guide the user from step to step and prevent them from triggering intents before you want them to. This will make a much better user experience! In this lesson, you learned all about intent Triggering and Activation. In the next lesson, you'll learn about Variables.